Confession time, enthusiasm is not in abundance for this subject of fungus, reason being, in most cases of fungal infection the author has observed; there has been very clear clinical signs of the primary cause and in many cases multiple primary causes, also fungal infections can be cleared up relatively easily. So, a valid attempt has been made to try and cover all the bases, without pointless waffle, well that’s the aim. 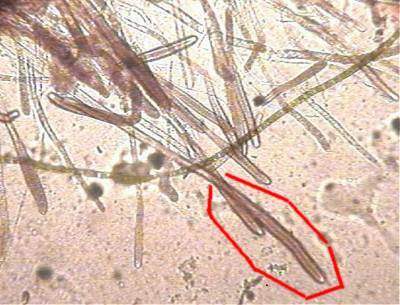 Mycosis is a relative term covering fungal infections, the word Mycotic comes from the Greek meaning mushroom, and Fungus is the Latin word for mushroom. Fungi proliferate everywhere, from inside our homes (damp spots or food) or on our person right through to the aquatic environment of the koi hobby, indeed any fish keeping hobby. No matter how clean the pond system or aquarium, fungal spores will be present in ample quantities to cause problems should an opportunity arise. Before anyone thinks they have a major problem and goes reaching into the medication cupboard after reading this snippet of information, a reality check is called for! Despite being every present, relatively few species of fungi cause disease in fish, and these are nearly always saprobe types. Fungal infections are always secondary and never primary, and will NEVER attack a healthy, undamaged and stress free fish with good water conditions, there is always a stressor that will bring about a fungal infection, be it poor water quality, resulting in a suppressed immune system or parasitic involvement or a breach in the skin caused by either damage or a bacterial ulcer. Fungus will always be secondary infection to an underlying primary cause/problem. Each cell has at least one Nucleus while some have two distinct nuclei, but apart from not having a liking for growing on live healthy tissue, fungi will attach to almost any organic. All fungi are Heterotrophic; needing an organic food source, this is usually dead organic matter. Enzymes are released to break down an organic into an absorbable form of nutrients for growth and reproduction, absorption of nutrients takes place through the cells walls that are made up of either Cellulose or Chitin. Unlike plants; fungi are unable to synthesise their own essential nutrients. Normal sexual reproduction takes place by the union of two nuclei one from each of two separate cells, newly formed cells form a fertile hypha that will release infective spores, usually at the end of the, "Hyphae". The main form transmission is by spores and while many fungi are carried on the wind (airborne), the reproductive cells will release spores into the water where they will eventually settle out and attach to something organic and start over. So fungi are a natural occurrence that can be found in both the main body of the pond and in the filter, where, it should be mentioned that they will usually survive doing a useful tasks like; breaking down waste products, like uneaten food and faeces, for fungi life will continue like this until the day we get a stressed or damaged fish for it to infect. In the koi hobby as far as fungal infections are concerned, fungi will affect both fish and fish eggs, and are characterised by a typical white cotton wool like growth on either the fish or the eggs, which in time will take up algae as a food source and this will tinge the colour of the fungi green. In the case of fish eggs, many will eggs will die off quite naturally and fungus will emiediatly infect these dead eggs, further death of eggs will accelerate because the fungal infection will smother live eggs and rob them of natural access to O2 in the pond. Prophylactic treatments against fungi can be effective but are usually futile, as fast as you neutralise fungal spores, new zoospores are introduced into the system; so the only real beneficial protection is impeccable water condition and a stress free environment. Prophylactic treatments for newly laid fish eggs in a fish farm is an entirely different matter and can be extremely beneficial as the eggs will hatch in a few days and this will give hatching a chance before fungus can attack them and make them unviable. Microscopic examination is required to differentiate between species and even then in a lot of cases only a fungus expert will tell them apart, as treatments are identical we will be dealing with the most common Saprolegnia, pronounced "sapro-leg-nia". All the saprolegniaceae family are collectively know as water mould. Saprolegniaceae are found the world over in fresh water right through to brackish water, although a very small number of species can thrive in brackish water up to a maximum of 2.5% salinity. Saprolegniaceae do not exist in seawater (3.5% salinity). Reproduction of most species of the Saprolegniaceae family can be sexual by joining of two nuclei, but the most common reproduction is by asexual reproduction. All freshwater fish are susceptible to Saprolegnia, with dead fish eggs being an ideal media for Saprolegnia to grow on, further fish eggs will be killed off by suffocation after Saprolegnia gains hold and starts to grow prolifically by ample production of zoospores to infect further eggs until all the eggs in a particular batch or batches are dead. Saprolegnia has a dislike for living tissue and will be found on dead and decaying organic material, the sub-species that are found as pathogens on koi/fish can be either saprobes or facultative parasites. Dead fish are also an ideal target for Saprolegnia. It is almost impossible for a dead fish to remain in any pond water for a prolonged length of time without being invaded by Saprolegnia. If left there for any length of time the end result would be a further increase in pathogenic spores. There is no evidence of Saprolegnia every being a primary cause, with malnutrition being the major causes for attacks by Saprolegnia, and as previously mentioned further root causes can be: toxic conditions/ poor water quality, fluctuating Ph, skin/fins or gills damage, be it by natural causes, parasite involvement or bacterial infection, poor food quality with contamination, stress (GAS Syndrome) and on the odd occasion high salinity or, most of the above create near perfect conditions for Saprolegnia to target a host. Evidence supports the theory that the mucus layer of fishes contains an anti-fungicide, so it follows that a suppressed immune system gives saprolegnia and idea window of opportunity for attack. Furtive spores settle on koi all the time they are not selective in their target but cannot not take advantage if the area is undamaged or the host is not vulnerable however if a spore lands on an area of damaged tissue or a weakened immune system it will propagate and begin to grow out from the site. Once the host is infected the spread of this disease is best described as rapid and is further aided by digestive enzymes produced by destroying surrounding healthy tissue for the infection to begin to spread out over the surface of the host, well before this stage of the infection occurs, it is imperative to remove the infected fish to a quarantine facility as once the infection is advanced huge amounts of Saprolegnia zoospores are produced and this boom in spores makes further infections of new hosts more likely. Be wary that the root like systems for a Saprolegniasis infection can ingress into the fish and cause internal damage and is not just what is evident or visible on the surface.